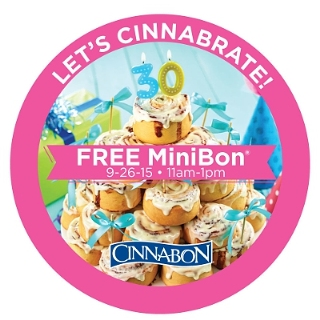 Cinnabon is celebrating 30 sweet years by giving away FREE MiniBons from 11:00am – 1:00pm local time on 9/26/15. Limit one per person, per visit. Valid in the United States, Japan, Philippines, Russia, Colombia, and UAE. To make the day even more exciting, join Cinnabon on Twitter and Instagram by sharing a picture from the bakery showing us how you are celebrating. It’s been #30SweetYears. Let’s Cinnabrate!